Equipped with the IP code IP44, the attractive ceiling fan Outdoor Elements II is wonderfully suited for outdoor use. The watertight plastic blades are designed in an interesting leaf shape and have a palm frond structure on one side and a rattan pattern on the other. They can be installed either way up, depending on your requirements. The ceiling fan Outdoor Elements II can also be installed on sloping ceilings. It is equipped with a practical forward and reverse rotation function which allows you to switch between summer and winter mode. This is controlled by means of a sliding switch. The fan is controlled using a pull chain. As well as turning it on and off, it is also possible to select three different speed levels. The ceiling fan can also optionally be controlled by a wall switch. A suitable wall switch is available as an accessory. 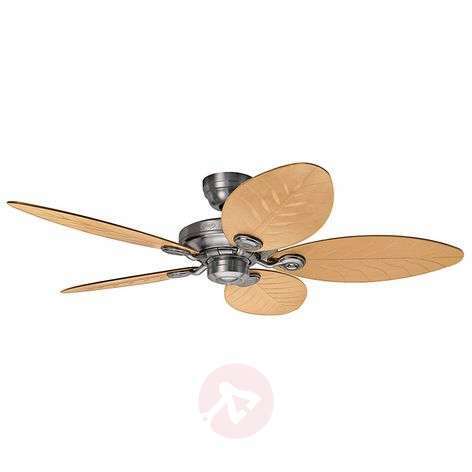 The ceiling fan Outdoor Elements II can also be operated with light. A suitable light is available as an accessory. Can this product be supplied with a longer extender so it can be fitted to the apex of a vaulted conservatory roof? Thank you for your enquiry. Kindly note that it will be possible to extend the rod. Please contact our customer service who will be able to request the correct part from the manufacturer.